It’s possible to turn up during any day and take a stadium tour. 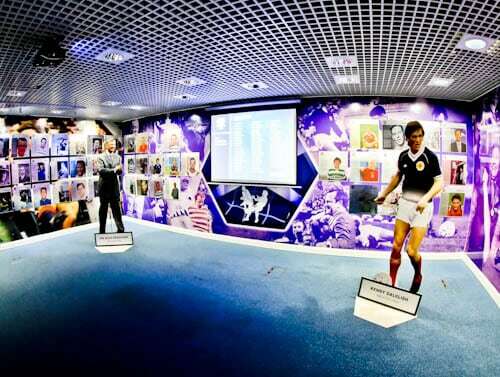 To better organise your time, visit the Scottish Football Museum website and view the tour times. Hampden Park is located in the southern Glasgow suburb of Mount Florida. The easiest way to get there is by train from Glasgow Central to Mount Florida station. It’s a further 5 minute walk from Mount Florida station to the stadium. 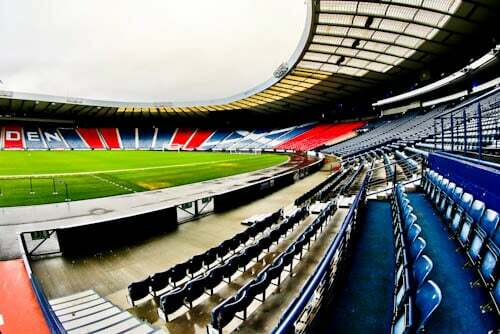 When Hampden Park was first built in 1903 it was the largest stadium in the world. As a matter of fact, in the early 20th century the capacity grew to 150,000. It’s no surprise that the highest attendance was a game between Scotland and England in 1937. 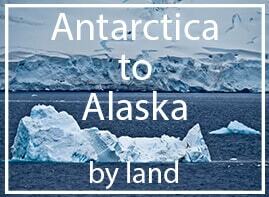 Over the years, mainly due to safety reasons, the capacity has been reduced. In 1999 the stadium was renovated and the capacity today is around 52,000. It’s famous for football but huge concerts have also been held here. 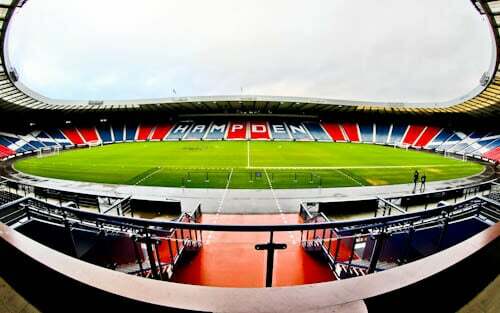 Stars such as Beyonce, Ed Sheeran, Eminem, Bruce Springsteen, Sir Paul McCartney, Sir Rod Stewart and Tina Turner have all performed at Hampden Park. The stadium tour starts from the Hampden Park Shop. 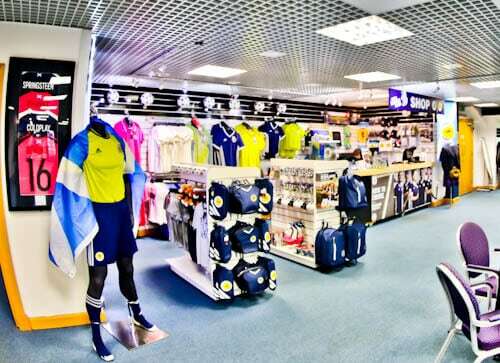 Simply walk into Hampden Park through the main entrance and reception staff will take you to the store. If you haven’t bought your stadium tour tickets you can buy them here. Moreover, you can check out the Scotland merchandise and there’s also a coffee shop. Of course, there are clean bathrooms at Hampden Park. 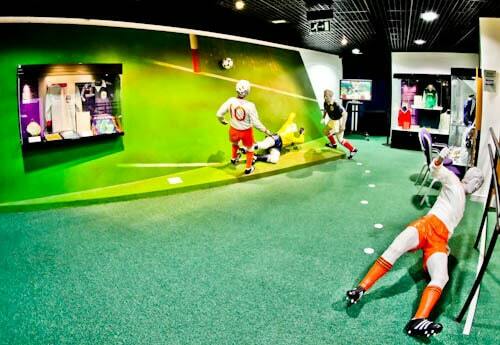 I highly recommend the Scottish football museum. Scotland has a rich football history which is incredibly interesting, even for non Scots like myself. Sir Alex Ferguson and Sir Kenny Dalglish are just 2 of the hundreds of Scottish legends in the Scottish Hall of Fame. Furthermore, the museum is well organised and takes you from the beginning of Scottish football history, right up to the present day. Not only does it follow the national team but it also follows the history of Hampden Park. You can even sit in a preserved part of the old stadium and watch a historic England Scotland game. Finally, there’s also a sad part to the museum which explains how the world wars affected Scottish football. Did you know the oldest association football trophy in the world is the Scottish Cup. You may argue that the FA Cup in England is older. This may be true however, the original trophy disappeared. 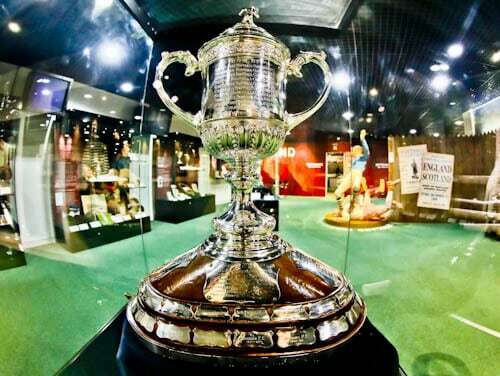 Whether Celtic, Rangers, Hearts or any other Scottish team win this trophy, due to its value it always remains in Hampden Park. As you explore the museum, do not miss this historic trophy. Lastly, an interesting question you could ask the staff; ‘Is the Glasgow Rangers name on the trophy?’ You’ll be surprised by the answer! Archie Gemmill scored a wonder goal for Scotland as they beat Netherlands 3-2 in the 1978 World Cup. This is considered to be Scotland’s best World Cup moment. For this reason, part of the museum is a monument to this goal. In addition, there’s historic World Cup memorabilia from this group including the 1978 Iran jersey. Although Scotland beat The Netherlands, they did not qualify for the second round whereas The Netherlands made it to the final. One of the most impressive things in the museum is the historic Hampden Park home team dressing room. When the stadium was renovated in 1999 new dressing rooms were installed. 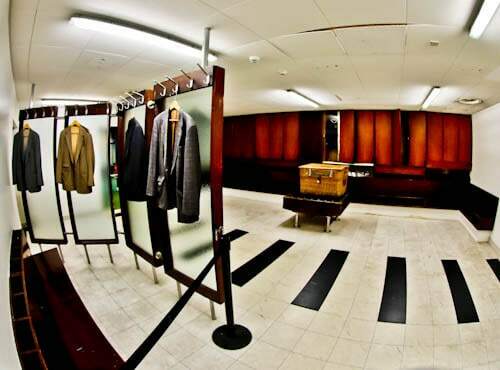 Thankfully, the original dressing rooms were preserved and moved to the museum. 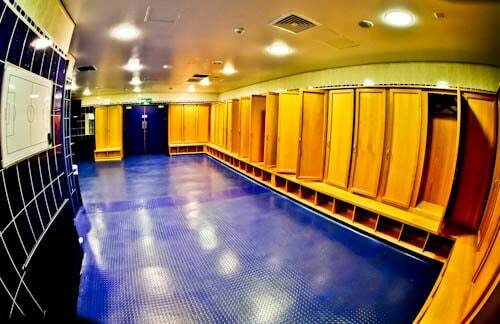 Imagine all the Scottish legends who have used this dressing room. Gordon Strachan, Graeme Souness, Denis Law, Sir Kenny Dalglish but to name a few. Why didn’t someone have this idea at Wembley Stadium? Additionally, you’ll find other historic parts of the old stadium around the museum such as the turnstiles as well as an old seating area. How fast can you kick a football? As part of the Hampden Park stadium tour you can find out. You’re welcome to kick the ball into the back of the net and it will tell you the speed. In my group the average speed was around 45 mph, let me know if you can kick it faster. 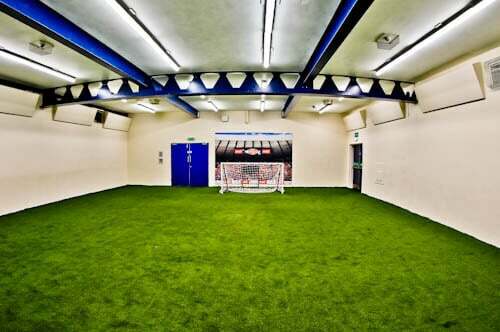 By the way, the room you kick the ball in is the players warm up area and both the home and away team have access to it. The home team dressing rooms are used by both the Scotland national team as well as Queens Park FC. 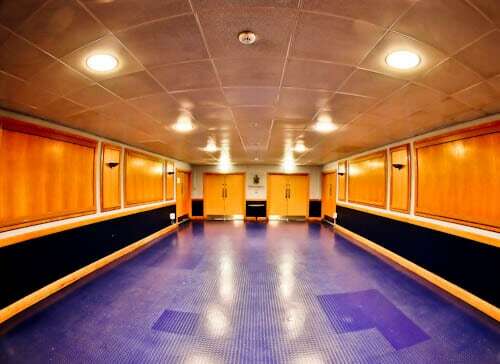 In addition, if it’s a Rangers Celtic Scottish Cup final, Rangers will use this dressing room. So why would Celtic choose the away team dressing rooms? Because it’s on the Celtic side of Glasgow and logistically makes sense. Even more so historically when fans would walk to the stadium. Finally, when Real Madrid played Bayer Leverkusen in the 2002 Champions League final, they used the home dressing room. On this occasion Zinedine Zidane scored arguably the best ever Champions League final goal. The away team dressing rooms are virtually identical to the home ones. 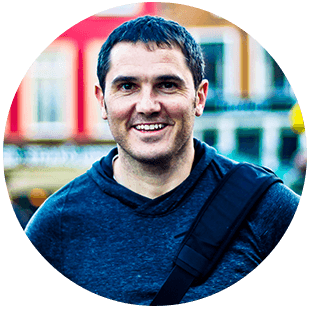 As a result, there’s no real advantage or disadvantage to which you’re in. 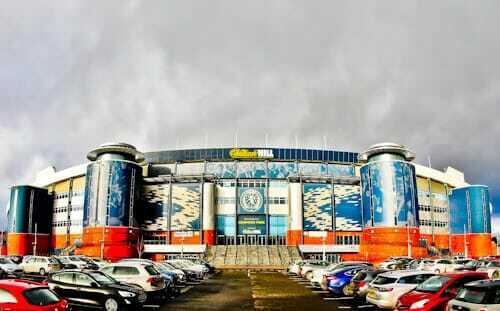 The reason the facilities are identical is because this is a requirement of a UEFA 5 star stadium like Hampden Park. The players tunnel is incredibly spacious with a Queens Park FC logo at the entrance to the pitch. Their logo states in latin, ‘To Play for the Sake of Playing’. Queens Park FC are the only amateur club in the Scottish professional league. You’re welcome to pose for pictures pitchside. I would say this is the best place to take a picture, with the iconic Scottish flag background or the colorful Hampden logo. Additionally, you can also visit the dugout and the Royal Box which is behind it. Where are you from? Spain, Germany, South Korea? You could pose here in your national team jersey as all teams are welcome at Hampden Park. You can turn up any day and take a tour. However, to better organise your time visit the Scottish Football Museum website and view the opening times. Or better still, there could be an event on when you visit Glasgow. Check out the Celtic stadium tour, Rangers Stadium Tour or the most Instagram worthy locations in Glasgow.